Creating a beautiful cake can be easy with the application of a few simple cake decorating techniques. The incredibly intricate cake designs displayed in recipes intimidate many beginner bakers. These confections are covered in complicated icing weaves, swirls and bouquets of fondant and gum paste flowers. However, there is much more to the art of successful cake design then just piped icing and rolled fondant. Unique gorgeous cakes are well within reach (even for the amateur decorator) by applying creative decorating strategies, either one or several methods per project. Don't be afraid to make a mistake, most cakes are very forgiving and errors can be easily covered with a little more decoration. Cake designs are usually dependent on the type of event, time of year and what effect the baker is trying to achieve. It is a shame that some beginners think professional looking results are unobtainable because they have not yet mastered a piping bag or draping fondant. Piped icing designs can be lovely but require a great deal of practice and an extremely steady hand to produce spectacular effects. So try other simple cake decorating techniques on your special occasion cakes until you gain experience and confidence. 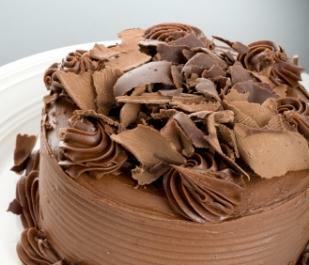 Chocolate is a successful decoration depending on the flavor of the cake and temperature of the venue. Keep in mind that if the weather is hot or humid your chocolate will melt or sweat which will definitely not be the desired effect. If your cake is taste compatible and the forecast favorable, chocolate is an easy decoration to tackle using various methods. Pile dark or white chocolate curls on top of a cake or cover the entire surface for a gorgeous textured appearance. Curls are created by drawing a sharp knife or vegetable peeler on a slight angle over a large block of slightly warmed chocolate. Use chocolate leaves to accent other cake design elements or to stand alone depending on your cake theme. Gather a quantity of different sized edible leaves such as grape, lemon or rose leaves and wash them thoroughly. Blot the leaves dry and using a paintbrush cover the leaf surface with a thin coat of tempered chocolate. Chill in the fridge and then paint another layer over the first set one. Repeat this process once more and chill thoroughly. Slide the chocolate leaf off the real one carefully using the tip of a sharp knife if necessary. Store your chocolate leaves in a cool, dry container until needed. Fondant can be daunting when trying to cover the entire surface of a cake; so try cut outs instead. Use a selection of interesting or appropriate cutters to produce flowers, geometric designs or even words from rolled out, colored fondant. Simply roll out the fondant and cut the desired shapes for your cake. Press these shapes onto your iced cake in patterns that follow your design theme. Another simple application for fondant is imprinting the icing with one of the many patterned rolling pins available at specialty kitchen stores. You can create weaves, honeycombs, polka dots and brick patterns by rolling the pin over the fondant evenly. These lovely glittering cake decorations can add elegance to any design. 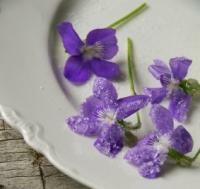 Crystallized flowers and fruits are actually more durable than fresh and very easy to produce. Remember, when using flowers, everything on the cake needs to be edible or at least non-toxic. Be aware that flowers can cause allergic reactions in some people, especially those with asthma and always make sure your flowers come from an organic grower that certifies the blooms are pesticide and herbicide free. The method to crystallize fruit and flowers is very simple. Select your desired items; wash and blot them dry. Beat two egg whites and two tablespoons of water together in a small bowl and dip the flowers or fruit into this mixture, coating thoroughly. Shake off the excess liquid and then using a small spoon sprinkle superfine sugar over the entire surface until covered completely. Place flowers or fruit on a wire rack and dry overnight. Cookies such as ladyfingers, brandy snaps and madelines make pretty, whimsical decorations on any cake and can easily be applied even by children who wish to help in the process. Simply bake or purchase the desired quantity of cookies and press them firmly onto the sides of a freshly iced cake in neat rows. Trim the cookies if necessary to make them fit well. If appropriate, wrap a complimentary colored ribbon around the finished sides and tie a neat bow to complete the look. The range of quality food colorings available is impressive and it covers the entire possible spectrum of hues in the rainbow. These colors can be used for more than just tinting icing. Anyone who has a talent for painting designs and flowers on paper can utilize this skill directly on a cake. Cake painting can produce spectacular effects ranging from interesting china and fabric patterns to the look of stained glass. You can even copy popular wall painting techniques and actually sponge or texture colors onto the cake. The process of cake painting starts with picking out your pattern or picture. Decide on the colors needed and practice your brush skills on a piece of rolled fondant to gauge how to load the brush, the actual color on the white background and the extent of pressure needed to produce your design. Then simply paint your fondant covered cake and let it dry. Creating a cake is supposed to be a fun and satisfying experience. So try simpler ideas instead of struggling with advanced decorating techniques. The finished cake will be professional looking as well as beautiful with very little stress.